From Stanislaus County, Modesto, and Stockton area offices, Tai C. Bogan, the principal attorney with The Bogan Law Firm, A Professional Corporation, focuses the practice in these areas: Criminal Defense, Driving Under The Influence (DUI), and Personal Injury. Most of our criminal defense cases are accepted on a flat fee basis. That means you know exactly what it is going to cost you when you hire us. In addition, almost all of our personal injury cases are accepted on a contingency. A contingency fee means that you only pay attorney fees if we win, either by settlement or trial verdict. Anyone can be accused of a crime. You may never have ever thought about having to hire an attorney to defend you in court. But the fact is that thousands of people are wrongfully accused of and charged of crimes. Driving Under the Influence (DUI), sometimes called drunk driving or Driving While Intoxicated (DWI) is a crime in California. District Attorney offices are filled with skilled attorneys that are well funded with what seems like unlimited government resources. Families of those accused of crimes should be equally cautious. Self-representation is like putting your head into the lion’s mouth, never a good idea. Finding the best criminal defense attorney for your case is difficult. Sometimes people will want to use an attorney that their family refers them to. However, using a family attorney who does not know criminal defense law could be a disaster. Criminal defense is not for every attorney. Since you or your family is looking at jail or prison, you need the best lawyer for your case, not your dad’s golf buddy who practices medical malpractice civil law. On the other hand, you might be using the internet to find an attorney. This too can prove problematic. Searching for terms like “criminal defense lawyer” or “how much does a criminal defense attorney cost”, may lead you to good lawyers or bad ones. Just because the attorney’s website is ranking high on the search engine doesn’t mean they are the right attorney for you. You should call each attorney office before you decide to hire them. Most people want an experienced local criminal defense attorney. Many people are surprised when they hire an attorney from the internet to later learn this attorney’s office is 3 hours or more from your courthouse. Unless you are from very far away and cannot come to the attorney’s office, you should always meet with the attorney face-to-face in their office. All is not doomed. It is extremely important you hire an aggressive and experienced Stanislaus County attorney to combat the government and level the playing field. A Modesto criminal defense lawyer with The Bogan Law Firm, A Professional Corporation is the great equalizer because the attorney knows criminal defense and how to give you the upper hand. Don’t hesitate, schedule a confidential consultation with our office at 209-56-LEGAL or 209-565-3425. Injuries can happen to anyone, because injuries do not discriminate or play favorites. Whether you are rich, poor, young or old an injury caused by someone or something can stop you in your tracks. When you are injured, The Bogan Law Firm, A Professional Corporation is here for you. The most common kind of Modesto are personal injury case is a car accident case. A car accident can cause major injuries up to and including death. Car accidents can cause you to rack up significant hospital bills and lost wages. 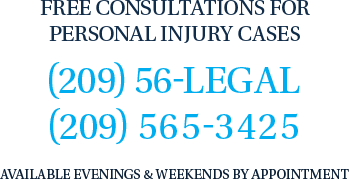 The purpose of hiring a personal injury attorney is to get money to pay those plus compensate you for your pain and suffering. At our law offices we want to give a voice to victims of serious and deadly injuries that are caused by irresponsible people. We want to make sure you are taken care of medically and financially. What sets The Bogan Law Firm, A Professional Corporation apart from other personal injury firms is their dedication to the individual. If you are looking for a personal injury lawyer who will treat you like a client and not like cattle, then please call The Bogan Law Firm, A Professional Corporation immediately at 209-565-3425. There are many good lawyers in California. Choosing a lawyer is a very difficult decision. Even the best lawyers may not be a good fit for your particular case. That is why it is important to find the attorney who best fits with the facts of your case. Mr. Bogan will always put your interests ahead of all others and keep an open line of communication with you. When retained, the Modesto criminal defense attorney with The Bogan Law Firm, A Professional Corporation becomes your personal advocate. They work relentlessly for superior results while keeping the client involved every step of the way. The Bogan Law Firm, A Professional Corporation is committed to personal attention and service while producing satisfied clients is what separates an attorney with The Bogan Law Firm, A Professional Corporation apart from other lawyers and law firms.